15 tornadoes occur across Wisconsin and damage buildings in Arkdale and Merrill, Wisconsin. Today was going to be frustrating from the start. Storm chasing is tough in April because the jet stream is usually strong which helps storms to travel at a high rate of speed. Storm motions were expected to be over 50 mph and horrible storm chase terrain northwest of Madison, Wisconsin would possibly hamper our efforts of being able to keep up with a severe storm or tornado. James and I positioned ourselves in Tomah, Wisconsin at a gas station waiting for storms to fire along the cold front in northeast Iowa. The Storm Prediction Center had issued a Particularly Dangerous Situation - Tornado Watch which in itself is rare for Wisconsin standards. Around 4:30 p.m. severe thunderstorms developed and quickly became severe across northeast Iowa up through western Wisconsin. We decided to hang tight and see how quickly they would evolve into supercells and which storm would be worthy of chasing. 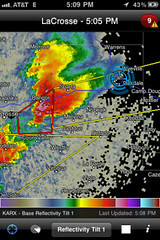 Thirty minutes after initiation, the first tornado warning was issued directly to our southwest. We got a gauge on where the storm would head and decided to jump southeast on the freeway. Unfortunately, the traffic on the interstate came to a halt a couple of miles east of Tomah, Wisconsin. With each passing minute, the supercell was looking stronger with a very large hail core on radar and a respectable hook echo signature. The storm had a forward speed of nearly 50 mph and continued to have a tornado warning since its birth in northeast Iowa. It was only a matter of time the storm would overtake us. Reports were coming in over the scanner of tennis ball sized hail falling behind us near the gas station we were at in Tomah. The forward flank of the storm began to impede us with rain as traffic continued to be at a standstill. 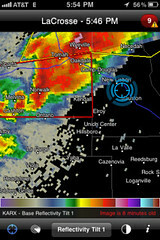 Storm chasers drove up from behind on the shoulder to get out of harms way and we followed suit for a mile to reach the Oakdale, Wisconsin exit to travel south. Many cars followed us knowing what situation they were facing. We had no choice to abandon the cell behind us because the traffic jam took us south of the interstate. The storm was projected to track north of the freeway and it had dropped an EF2 tornado in Arkdale, Wisconsin. We picked the right storm to chase, but the traffic jam put us behind and couldn't find a new road to take us north. We found an open area to observe a new storm that was tornado warned to our southwest. 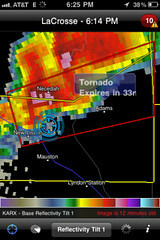 We watched it for several minutes and a small wall cloud developed. The cloud structure seemed to tighten into a funnel cloud in the distance as it came closer to us (see our video below). I was ready to call and report it to NWS La Crosse but it dissipated after a few minutes. The storm raced off to the northeast and we simply had no choice but to let it go due to the fast storm motion. There were additional storms to our north and they continued to organize and produced more tornado warnings as they traveled to our northeast into central Wisconsin. We decided to head back home as the terrain and storm motions were simply no match for us. 15 tornadoes were documented across central and northern Wisconsin. This outbreak did surpass the old April record back in 1984. Thankfully no lives were lost.